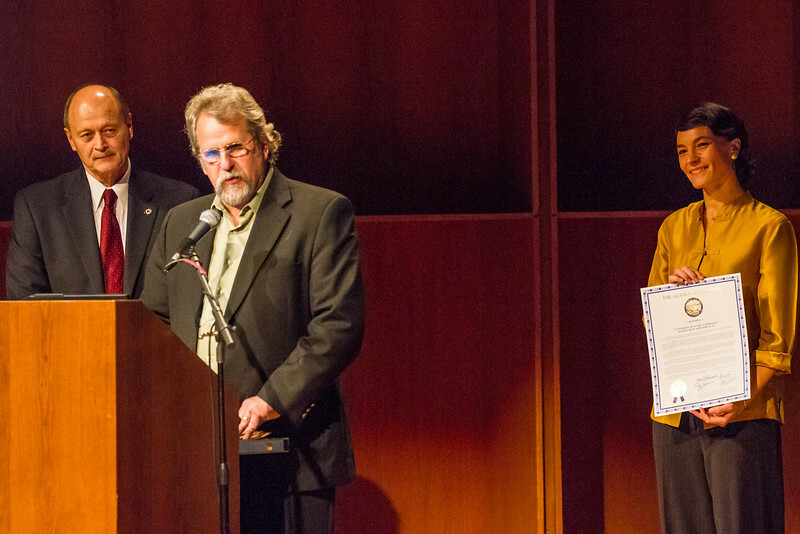 Members of the Alaska legislature Rep. Dave Guttenberg and Sen. Joe Thomas present UAF Film department head Maya Salganek with a copy of the proclamation. The state voted to continue to offer economic incentives for film and television producers to shoot in Alaska. Salganek was vital in organizing a grassroots campaign that demonstrated strong support for the program. All media are protected by copyright and may not be downloaded or used without permission. If you are interested in obtaining permission to use an image from our gallery, please fill out the online image request form. The University of Alaska Fairbanks is an AA/EO employer and educational institution and prohibits illegal discrimination against any individual. Learn more about UA's notice of nondiscrimination.